fischertechnik community forum • Thema anzeigen - Gears for Fischertechnik applications. I made 3 different models. 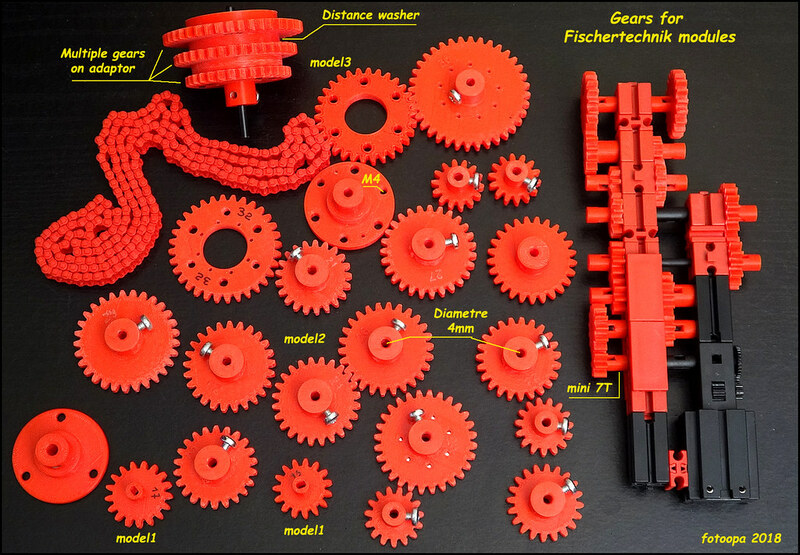 The gears are drawn with Autodesk fusion 360. I use the add-in function to create correct gear profiles. The gear pressure angle is 20°. I use a backlash of 0.1mm, this because during 3D printing the dimensions are always a bit larger. All sizes are drawn and tested for the Flashgorge Finder 3D printer with standard settings and a fill of 25%. I always use the Brim option and use Pelikan prefix Stick glue. Because the Flashforge Finder doesn't have a heated bed I let the hot water run over the surface so the bed heats up to around 40 degrees. This is very fast and always gives a perfectly flat result without wraping. The smallest gear has only 7 teeth. Smaller is no longer possible with module 1.5. The gear version with model 1 fits perfectly on FT parts such as FT 35 063,FT 35 064. I designed a gear range from 7 to 30 teeth with the model1. The gear model2 is meant to be mounted on a standard 4mm shaft. For this a screw is provided through a hole of 3.2mm. You can tap in M4 thread or use a parker screw. This allows you to secure the gear to the 4mm steel shaft. Model2 has a range of 13 to 33 teeth. These can be mounted on a steel 4mm shaft or the plastic version of FT. Model3 is intended to be mounted on an adaptor. You can also use spacers to mount multiple gears one after the other. Just like on a bicycle gear. Some gears are provided to mount one or more neodymium magnets D2x3mm. This can be used for home point or quadrature counter. The gears are chamfered on one side to better fit the standard chain. The other side is not going to bevel because of the 3D printing but it is not necessary. The width of the gears is adjusted for this. Model3 gears have 6 holes, 3 for the normal 4mm opening and 3 for threading. You can use M4 or any parker screws. I make the M4 with a low speed hand drill and an M4 wire tap. This is very quick and easy. 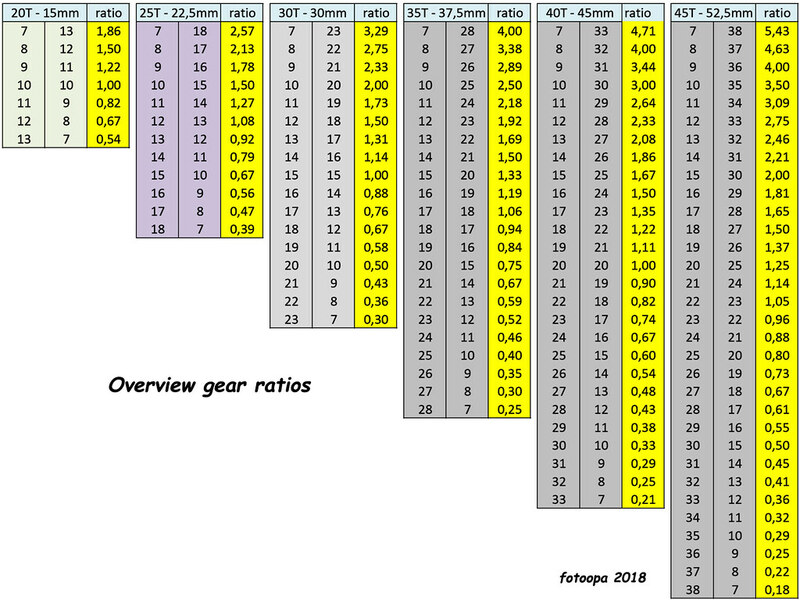 I have included a table with the gear ratios. The table is increased per 5 teeth because this corresponds to an extra FT distance of 7.5mm. I am aware that some dimensions may vary according to the 3D printer. On my Flasgforge Finder 3D printer the dimensions are quite correct. Everything is printed with PLA Avistron but every PLA will be good. Re: Gears for Fischertechnik applications. Very nice indeed, and very useful.